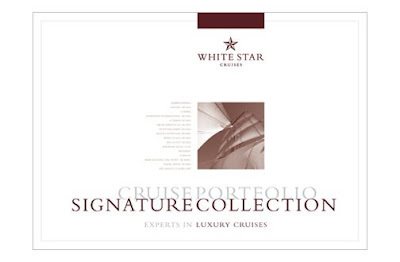 White Star Cruises was a new company set up by Wexas to focus more on a growing market in travel. 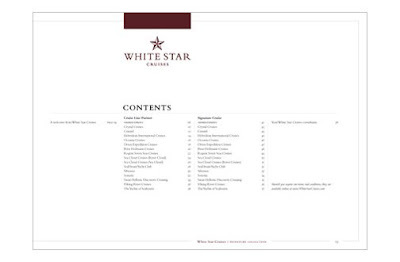 The design of the logo, print matter and the website happened simultaneously. We researched the cruise industry – brochures and posters – and paid particular attention to its heyday – the turn of the twentieth century. Our intention with the visuals was to try and give a new company a sense of permanence and trustworthiness. We played around with some obvious nautical elements but settled quite quickly on the 'nautical star'. Typographically, we went for a classical 'european' typeface in Monotype Bembo. 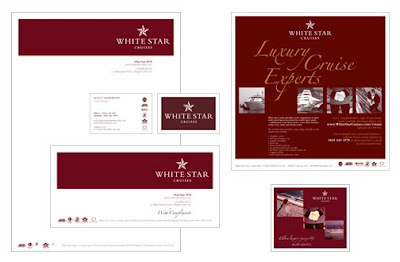 This, we felt, gave the identity the required sense of solidity, permanence and trustworthiness that the client wanted. In terms of colour we avoided blue and red – industry standards and, instead, went for a luxurious, 'leather-like' colour.